An apology letter to a husband or wife aims at asking for forgiveness for hurting the spouse. Marriage life has many challenges; spouses encounter problems in life and hurting your spouse is inevitable. Though you can apologize by word of mouth, making a call or texting your partner, at times you might find these ways ineffective or impossible. In such instances, write a letter and apologize for your actions. The words “am sorry” hardly come easy. When you have hurt your partner, you must be choosy in words to use to avoid aggravating the matter. Seek counsel from samples and templates to come up with the perfect message. Acknowledge your fault: Since you want to clear your differences with your spouse, avoid blame games. If you were on the wrong accept your mistakes. A genuine apology has its roots in taking responsibility for your actions. 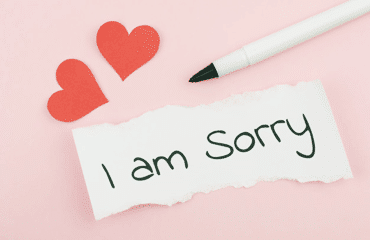 Be sincere: In the letter, let your partner know how sorry you are for hurting them. Your apology should come from deep your heart and not form your lips. Stick to the matter at hand; avoid apologizing for all the wrongs you have done in your entire married life. Respect their feelings: When you hurt your spouse, it affects their feelings most. Use words that will calm the situation. Consider how they feel as you write the letter. Ask them to forgive you: Your feelings may carry away you to explain the circumstances of the incident and forget to ask for forgiveness. Speak to your partner directly and humble yourself as you ask for forgiveness. When you learn how to effectively communicate with your partner, solving problems in your marriage will be easy. Suggest a solution to the problem: I the letter provide ways in which you can avoid a repeat of the incident. Ask their view on how to prevent a re-occurrence of the problem. Settle on realistic ways of resolving and preventing a repeat of the incident: In the letter request your partner for a meeting to talk over the matter. You can go for a retreat, outing, and dinner to talk about the issue. In the meeting agree on workable actions that will bring to an end the conflict. Don’t blame your spouse: Blame games do not lead to a resolution of problems. If you seek forgiveness and ways of preventing a repeat of the incident, only highlight your role in the incident. Be genuine: Your partner will understand when you are not genuine in your apology. Your actions should rhyme with your actions. Avoid apologizing when you are not ready. Avoid excuses: When apologizing, stick to facts. Admit your wrongs and ask for forgiveness. Don’t attach any demands to the apology: Don’t ask for anything in return for your apology. Your apology should be devoid of any conditions. I am truly sorry for [behavior]. It was uncalled for, and I am regretting the act. It wasn’t my wish to hurt you. I acted out of [anger, ignorance, emotions]. I understand your feelings right now. Kindly accept my apology and forgive me. When I remember all the good moments, we have had in our marriage my hearts melt with sadness. Remember when [include past good memories] and [another good moment].Al these moments remind me that our love is strong enough to overcome any challenge that comes our way. Despite the incident, I love you and stay committed to our vows. Once more receive my apologies. I look forward to a resolution of this problem soon. I am sorry for my unbecoming behavior of late. I hardly have time for you and our baby Mercy. Every time I leave work I result in visiting the nightclub to take alcohol. I understand your feelings at this moment; forgive me of these acts. I reflected on my behavior and realized that I am moving into addiction to alcohol. I have already seen my counselor for rehabilitation. I treasure you so much, and I cannot afford you your my precious wife and daughter because of alcohol. Kindly walk with me as I seek to reform and get help from addiction. When I remember the fun moments we had when Mercy was below two years old, I realize how valuable you are. I yearn for these moments once more. Let’s meet and talk over this matter before the end of the week. I am sorry for hurting you and my daughter. We will overcome.